Food is energy, calories are how we measure how much energy our food will provide us. When we eat, it raises our blood sugar and this suggests a presence of food energy in our body. When blood sugar rises as a response to our digesting meal, this in turn releases insulin. Insulin binds to the blood sugar i.e. glucose, and carries it to any depleted sources that need immediate energy. Muscle is one of the places you want your glucose to go muscle has glycogen stores, so the more muscle you have the more glucose it can absorb from our meal. The more calories used from our meal means it will be less likely to be stored for later use as fat. Our fat is stored energy and unused calories that will be tapped into when there is no presence of food energy. There is a hormonal relationship that occurs when our meal is digesting. When insulin goes up, glucagon, is low. When glucagon is high, it’s because there is a low amount of insulin/sugar in the blood stream. Glucagon is released when there is not enough glucose in the system, it will first take from the stored glucose in the liver, and then to body fat. When there is no food energy, i.e. 3-4hours in between meals, glucagon is released and this promotes glucose to be extracted. The time in between meals could be seen as precious fat burning opportunities. This is why eating small, well portioned meals 3-4hours apart from each other is so important, rather than skipping then bingeing or grazing all day with no purpose. When meals are well portioned in their carbs, protein, and fats, then the blood sugar and insulin response will be allotted towards your metabolic needs, and hopefully will not spill over into body fat. When the meal is portioned, then insulin is controlled so the hormone glucagon can rise when insulin falls allowing us to burn fat in between meals, or when we are sleeping. Don’t think if you starve yourself or restrict calories for long periods of time then you will burn more fat…fat loss does not work this way. We store body fat due to our evolution as a human being, so our body is not exactly friendly towards losing body fat that easily. If you want to lose fat, then there still needs to be a presence of food energy and enough to meet base metabolic needs, or else our metabolism will start to slow down and our stress hormones will rise. In turn, moderate starvation whereby skipping meals in an effort to restrict calories will only make your body hold on tighter to your fat in an effort to keep a calorie reserve. Bingeing on an enormous meal and ingesting a ton of calories all at once will provide a massive rise in blood sugar. It will most likely be more energy then you need for that day or time, because binges rarely occur when people are being extremely active. Since there is so much energy being ingested, it’s more likely the body will take the little it needs and the rest will be stored for later use. When we restrict calories and then binge, this behaviour over and over will encourage a slow metabolism i.e. burn calories/energy at a slow rate at rest, which in turn leads to a downward spiral of more fat gain. The more body fat someone holds, the slower their metabolism will be since their body is holding onto energy. On top of the negative effects bingeing has on body fat, the types of meals tend to be crap foods high in bad fats, carbs, and sodium. The binger may experience more health issues such as cardiovascular disease, or diabetes due to the types of foods and in massive amounts. Grazing on the other hand could be viewed as slightly better when compared to bingeing. But one thing about grazing on foods vs. having 5-6 well portioned meals throughout the day, is that grazing is constantly spiking blood sugar. It’s giving the body a consistent drip of energy, so insulin is always present in the blood stream interfering with the glucagon/insulin relationship. Nibbling on foods constantly every hour does not provide enough purposeful energy in one meal, so the calories are covering some grounds but will not be enough to hold you over 3-4hours. It’s a lot of blood sugar spiking and dropping on a consistent basis. Eating an apple, a few nuts, a bite or 2 of cake, a salad with no protein, a sweetened latte or sugar drink, then a few alcoholic drinks…this is not sustainable energy and will not meet day to day energy demands. When you are constantly giving your body a steady flow of blood sugar, there is no need for your body to pull from your liver or fat stores to make glucose for energy. If there is a presence of energy or a rise in blood sugar/insulin, then fat will not be tapped into. The person who grazes may not eat enough of a caloric surplus to gain a lot of body fat, but they also will not be eating purposely enough to put on lean muscle mass. A person who prefers to graze may be skinny fat, have a slow metabolism, and low lean muscle mass. Although they may not look like they hold as much fat on their bodies, what their overall body weight is made up of could be a higher body fat % then lean muscle mass. Grazing behaviour could lead to binge eating, and binge eating could lead to grazing. Grazing on foods instead of eating purposeful meals could be due to the fact the person is not sure what they should be eating, or has food aversions and are afraid to eat. This type of restriction and relationship towards food could develop a reward pathway in the brain, making us feel we are in a tug o war relationship with food. Constantly feeling as though we are resisting it, but also know that we need it. 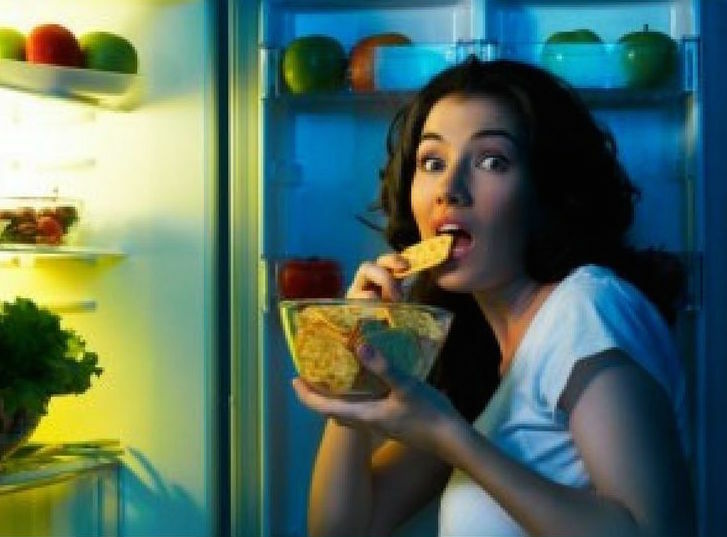 Picking on things throughout the day will likely not be enough calories to sustain energy needs, so the hunger may come out later in the night which is when a binge could happen. Due to the restriction of calories and the negative relationship with food, the reward pathway is being satisfied so a big dopamine rush may exist when the person is bingeing. They hate what they are doing, but they are also loving it in that moment…but also hating it. If someone binged the night before or in the morning, they may be more inclined to skip meals during the day and only nibble on a few things here are there. The binge could make someone feel incredibly guilty, which only burrows food aversions deeper and creates an even worse relationship with food. Although grazing and bingeing are different, they both are in a relationship as one can cause the other. At the end of the day, both promote terrible eating habits and scream disorganized and unplanned eating. Whether you are bingeing or grazing, either way you are not organized in your day to day menu of eating, grocery shopping, or prepping. The only advantage grazing has on bingeing is that overall caloric intake day to day is likely going to be less, so the grazer may not put on as much body fat over time when compared to the typical binger. Also, the grazer may not choose as many fast food options as the person who binges, so the types of foods consumed by the grazer may be healthier overall. The absolute best tried and true way to eat for a fit and healthy body composition, is to eat 5-6 meals, 3-4hours apart. The meals should consist of a protein, a healthy fat, and light on carbs (especially if you have a sedentary job or lifestyle). This will help control insulin and blood sugar surges, and deliver purposeful energy to the person so the meals meet metabolic demands.